How to Get FREE SMS Credits | Easy Recharging of iSMS Account | SMS Credit Purchase - lowest price & most reliable Bulk SMS marketing tool, 2 way sms Malaysia, works with Bulk SMS Singapore, online sms solution, web sms marketing. As a mission to provide excellent service to all customers, we have made sure it is easy for you to reload your iSMS account when you run out of SMS credits. With flexible payment methods, we aim to provide you the perfect SMS gateway solution. Welcome to iSMS. The steps below will guide you to reload your iSMS credits into your iSMS account. If you do not have an iSMS account, click HERE for FREE registration. You can only access to your member page after the registration. If you have purchased our iSMS credit packages, click HERE to learn how to reload your credits into your iSMS account. 1. Go to http://isms.com.my and click "Buy iSMS". 2. Alternatively, you can click on "Purchase" button, where the button at isms.com.my homepage. 3. You can also directly click on "Buy now" as shown below to proceed. 4. After clicking "Buy Now", the page below will display. In that page, you can choose any iSMS packages as listed below to reload to your account. The rate is displayed at all time. Also, the more you iSMS credits you purchase, the lower rate you get to enjoy. 5. In the screenshot below, there are various payment type for you to choose. 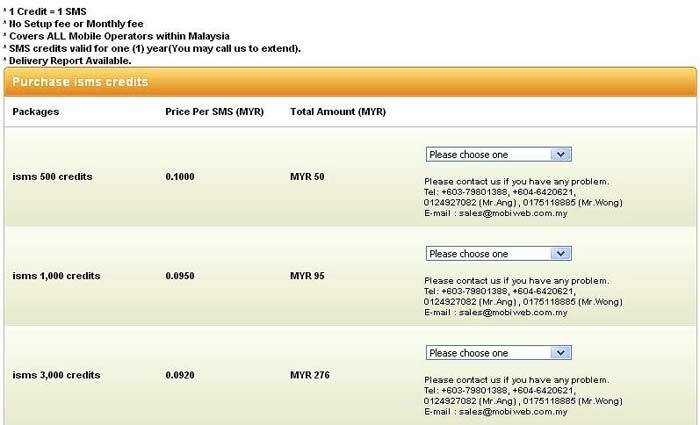 If you select a package isms 500 credits which will costs MYR 50, just choose one of the payment method to continue. 6. 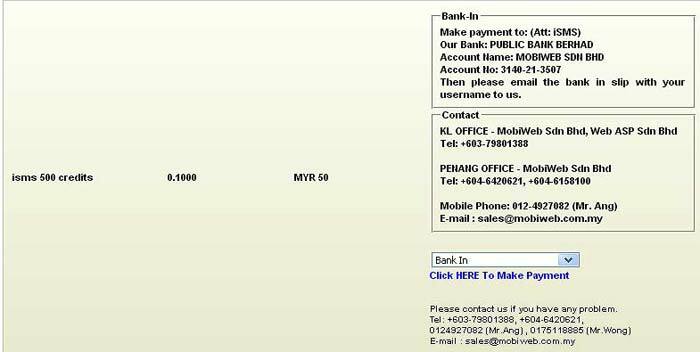 As you can see, you are provided a list of online banking methods to choose from such as Maybank2u, credit card, FPX (public bank), Mobile Money, Cimb Click, RHB Online, Alliance Online Transfer, Hong Leong Connect and others. 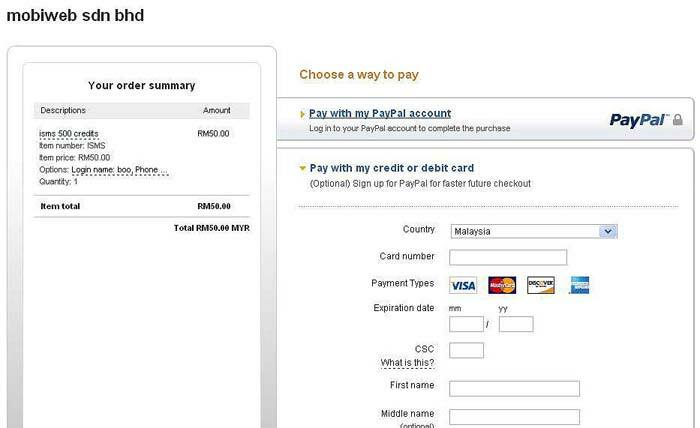 Fill in the details accordingly and click on "Proceed with Payment" button to continue. 7. When you choose "Bank In" payment type, iSMS Bank-in details will appear as illustrated below. After you have banked in your payment via ATM machine, please contact our sales team and email us a copy of the payment slip as proof of payment. 8. 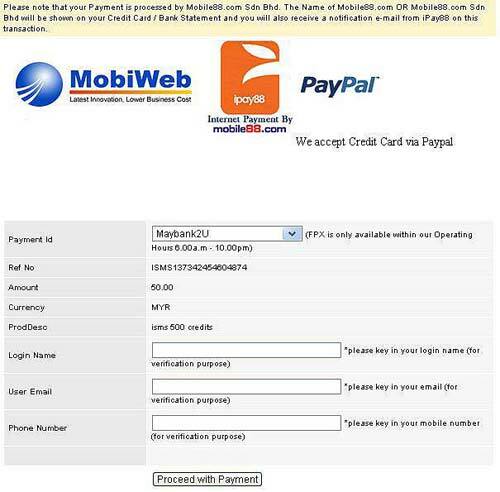 Choosing Paypal payment type will require you to fill up your iSMS login username and number. Then, click on "Proceed With Payment" to proceed. 9. After clicking "Proceed With Payment" button, you will be redirected to a page as shown below. From there, you have to fill in your credit card information as shown in the screenshot to complete the payment or log in to Paypal to proceed with the payment. The left column of the website will display the iSMS packages you have selected.